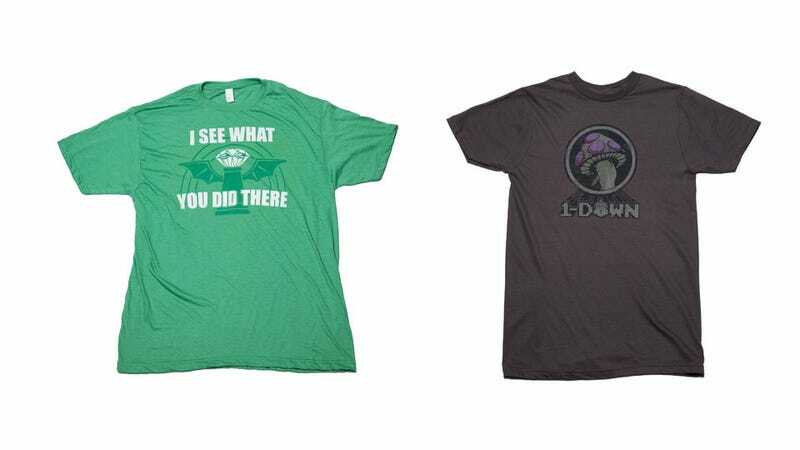 Gamer clothing creators Jinx have teamed up with Riot Games competitive PC gaming sensation League of Legends to create a set of shirts that I do not understand. Do you? Since Jinx is in the habit of lacing their licensed items with witty game references, I'm sure the first four or five shirts in their League of Legends line will make several million people out there giggle, and not being one of them doesn't excuse me from sharing these attractive designs. I at least understand the logo shirt with the werewolf guy on it. That werewolf guy probably has a name, and a bunch of you will make a point of telling me said name in the comments, thus freeing me from the responsibility of doing enough research to realize his name is Warwick, possibly? I do not need your approval, I merely crave it, like butter pecan ice cream. Possibly Warwick and the other designs are now available for sale at Jinx. Buy them for someone that understands.